Payette County Commissioners passed a gas and oil drilling ordinance after a public hearing on Monday at the courthouse. They heard testimony from Payette County residents, who mostly said the ordinance needed to expand the setback from 200 feet in the new proposed ordinance to the 500 feet that it had been in the previous ordinance. Several testified that a neighbor who signs a lease allowing drilling to be done on his or her property would force another neighbor to endure the drilling, despite their possible refusal to sign a lease. They said that 200 feet is not an adequate distance. At the request of the Idaho Transportation Department (ITD), the U.S. Forest Service is revising one of its interim criteria designed to define and govern the transport of megaloads through national forest land. But the change won’t make it any easier for the massively oversized shipments to win approval for travel along U.S. Highway 12 as it passes through the Nez Perce-Clearwater National Forest and its Wild and Scenic River corridors. The Forest Service is also asking to review megaload applications before permits are awarded by the state and is taking issue with the state’s insistence that it lacks authority to deny the permits. The Monday, July 29, Climate Justice Forum radio program hosted by Wild Idaho Rising Tide (WIRT) welcomes Mary Ullrich of the Paradise Ridge Defense Coalition board. Mary discusses how the Idaho Transportation Department (ITD) tried to control public opinion by presenting false information in its guide to the draft environmental impact statement for the Highway 95 Thorn Creek to Moscow reconstruction project. She also updates listeners on the current status of ITD and federal review and response to public comments and document revisions. Broadcast on progressive, volunteer, community station KRFP Radio Free Moscow every Monday between 7:30 and 9:30 pm PDT live at 92.5 FM and online, the show covers continent-wide dirty energy developments and climate activism news, thanks to the generous, anonymous listener who adopted program host Helen Yost as his KRFP DJ. Does Omega Morgan Know a Mega-Secret? Riddle us this, Batman: What does Omega Morgan know that everyone else does not? 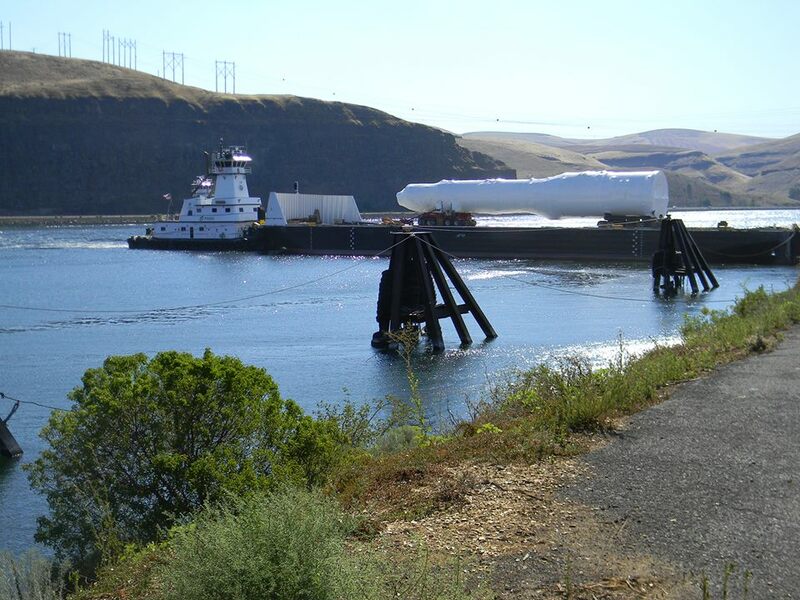 The transportation company – at no small expense – navigated two megaloads of equipment manufactured by Ellett Industries up the Columbia and Snake rivers to the Port of Wilma – in anticipation of moving them up U.S. Highway 12 toward the Alberta tar sands. If anyone can see any flexibility in Brazell’s recent policy closing U.S. 12 to megaload traffic, please enlighten us. His authority is rock solid. It comes from U.S. District Judge B. Lynn Winmill. Over the July 20-21 weekend, while climate activists from around the continent concluded the Rising Tide Continental Gathering at a remote Utah desert encampment, regional allies observed gigantic, spaceship-like megaloads traveling by barge up the Columbia and Snake rivers . Manufactured for destructive Alberta tar sands extraction, weighing more than 600,000 pounds and measuring up to 255 feet long, 23 feet tall, and 21 feet wide on specialized trailers, two of at least ten large, cylindrical, pressure vessels arrived and offloaded at the Port of Wilma, Washington, near Lewiston, Idaho, late on Monday afternoon, July 22. Heavy-haul company Omega Morgan has submitted a revised transportation plan seeking Idaho Transportation Department (ITD) permits for moving these wastewater evaporators across Idaho to Montana on U.S. Highway 12 . An evaporator sits idle at the Port of Wilma in Clarkston after arriving by barge. The equipment bound for Alberta will be used to recycle steam for processing tar sands (Lewiston Tribune/Kyle Mills photo). Industry touts ability of evaporators docked at Port of Wilma to create jobs, conserve resources. Two megaloads sitting at the Port of Wilma are creating work for Americans and are destined to help an oil company conserve water. The evaporators were manufactured by Ellett Industries near Vancouver, Canada, which purchased more than $2.5 million in American materials for the project, said Bob Gill, vice president of sales for the company. American tug boat companies handled the shipments after they entered U.S. waters just south of Vancouver, and the equipment was barged up the Columbia and Snake rivers, Gill said. Between 23:55 and 10:37 of the July 23, 2013, Evening Report, Idaho Rivers United, KRFP Radio Free Moscow interviews Idaho Rivers United Conservation Director Kevin Lewis about the possible implications of discrepancies between Forest Service authority and interim criteria to regulate megaload traffic through the Highway 12 wild and scenic river corridor and the arrival and push to move two Omega Morgan-hauled evaporators through the wildlands-surrounded route to Alberta tar sands mining operations. 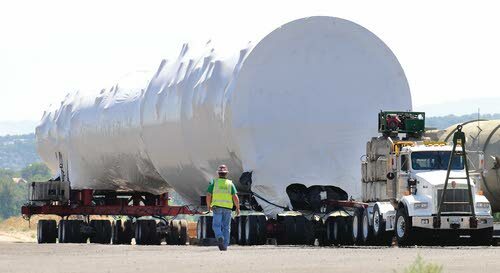 Permit or not, a megaload may be headed to the Port of Whitman County for eventual shipment over U.S. Highway 12. “They are apparently coming, and they are coming into (the Port of Whitman County) and not Lewiston,” he said. KRFP Radio Free Moscow interviews Fighting Goliath organizer Borg Hendrickson between 22:53 and 7:03 of the July 22, 2013, Evening Report, Omega Morgan Loads at Wilma. Borg talks about the plans, impacts, and possible accidents of megaload owners and transporters seeking to transform the Highway 12 wild and scenic river corridor into an industrial route for Alberta tar sands equipment, and the looming showdown between hauler Omega Morgan, the Idaho Transportation Department, and the Forest Service and Nez Perce Tribe, over evaporators offloaded at the Port of Wilma on Monday, July 22.